Yamaha's focus on its flagship F350 pays off. When Yamaha unveiled its F350 at the Miami Boat Show in 2007, it was with a clandestine air. Select members of the press were let in through a convention center side door at 6:30 a.m. — an unheard of time for anything to happen in South Beach. 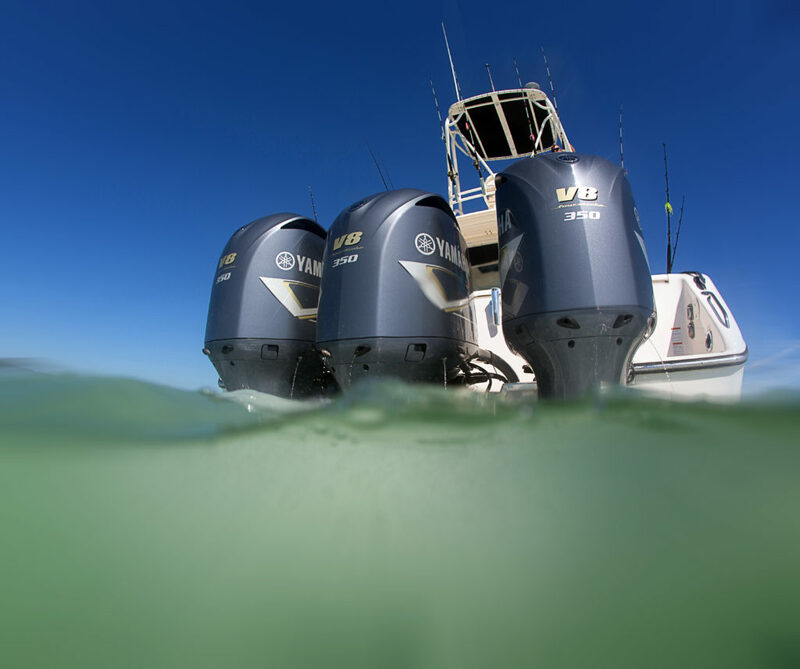 Members of the marine industry’s fourth estate are notoriously difficult to provoke a visceral reaction from when it comes to any new product, but when Yamaha raised the curtain on its new 5.3L V-8 outboard, we openly gasped and applauded. How Yamaha kept this under wraps I’ll never know, because the F350’s development was accomplished in cooperation with several boat builders, who were looking to build bigger outboard-powered boats. And Yamaha delivered the engine that they’d been waiting for. Fast forward nine years to a recent Yamaha press event in Baltimore, where the marine press eagerly awaited the announcement of Yamaha’s latest and greatest. For some, it might have been a little disappointing to learn the new motor was … an F350C. Wait, what? Many writers were expecting to see a larger number on the cowling, at least 400 — something Mercury accomplished with an engine block displacement of less than half Yamaha’s, by using a supercharger. But Yamaha has focused its efforts to make its flagship motor more reliable and fuel efficient, which most boaters have at the top of their wish list. The F350C received a modest cosmetic makeover this year with new graphics, but inside is a different story. Since the day Yamaha started producing the F350, it has been improving the motor, and Team Blue decided enough changes had been made to call it a different model. And the cherry on top is a new five-year warranty, which is the longest in the industry. So what’s changed? In its original iteration, one of its least desirable traits was the pronounced clunk when drivers put it in gear. I spent a lot of time on a friend’s Cobia 256 center console that had an early model F350; every time we shifted it, the clunk was loud enough that I thought this can’t be good, especially in docking situations that called for repeated shifts. Actually, it wasn’t doing any damage, but rather it was just a very positive engagement. In 2010, we got it retrofitted with Yamaha’s Shift Dampener System (SDS), which uses a uniquely splined rubber hub in the prop and a special cammed aft spacer on the prop shaft to absorb the vibration and deaden the sound — dramatically. Here are some of the other major tweaks. The F350 has slimmed down, to 763 pounds from 804, largely by replacing metal parts with strong, lightweight composite materials. The current F350C engine has a more advanced, owner-friendly electronic control unit (ECU) that alerts owners when the engine is due for selective maintenance points. Yamaha improved the engine’s corrosion resistance in areas near the waterline. The new-gen F350C has improved lubrication to critical bearings in the lower unit, to help them perform effectively, especially in prolonged high-load environments, a common occurrence for offshore boats used in heavy seas. The outer cylinder sleeves of the F350C now feature a dimpled surface, which maintains the roundness of the cylinder, for decreased oil consumption, and increases the cooling surface area of each cylinder, for added reliability. The F350C is now available for quad applications (1,400 hp!) and is compatible with Helm Master, Command Link Plus, Command Link Gateway, Y-COP, Variable Trolling RPM Switch (VTS), and it has an analog gauge interface, so owners repowering an older boat can use their older gauges. Although originally designed for large offshore boats, the F350 quickly found favor on many other boats — a surprise for Yamaha — such as the Bennington 2575 QSBW we recently tested. It’s a big, luxurious pontoon boat with a giant 32-inch elliptical center tube, and the F350C proved to be a great match for its 4,154-pound hull. It got on plane with very little bowrise in 2.5 seconds and powered its way to 30 mph in just 5.6 seconds. Top speed was an eye-watering 51.7 mph. What’s notable about the power curve is how flat it is. There are no peaky points or dead zones, so whether you are getting your boat on plane or working the throttle in heavy seas, the F350C responds instantly to any input on the Command Link Plus drive-by-wire throttle.